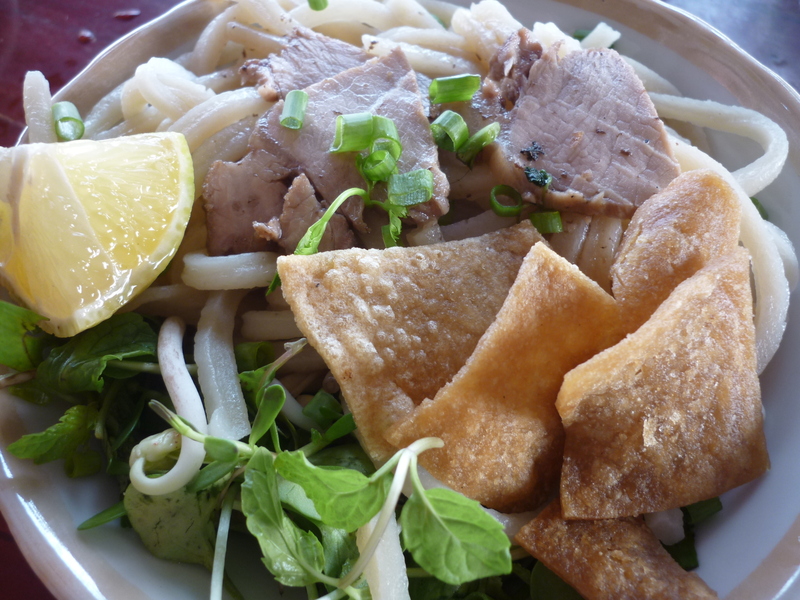 Cau Lau is a truly local dish that uses local spring water and the ash from a local tree. The embodiment of local. It’s complex to recreate but worth it to create such a unique plate. 50g dried shallots/onion or 10 fresh shallots.. Finely chop the shallots add to a large suacepan with the pork bones, water and dried prawns. Simmer on a medium heat for approximately 5- 6 hours until 2 liters of stock is left. Skim the fat off the top and pour through a sieve . Season with the MSG (for a more authentic taste) or salt. Crush the garlic into a paste and in a bowl mix this with the salt, Chinese five spice, soy sauce, sugar and the pork. Ensure the meat is well covered and leave to marinade for 1 hour. Lie the pork fat on a flat surface and carefully cut the soft fat as closely as possible from the skin. Cut the skin into 2.5cm x 2.5cm squares. Pre-heat a frying pan on a medium- high heat, with enough oil so the base of the pan is completely covered and fry for around 4 minutes, sprinkle evenly with salt and turn over. Fry for another 4 minutes until the fat is golden brown and crispy. Leave on kitchen towel to remove the oil from the skin pieces. Now the pork has marinaded add to a frying pan with ¼ cup water and all the marinading juices. Cook slowly over a low heat for around 20 minutes until the water has evapourated. Slice the meat 1/2cm thick. Remove the stalks from the mint and coriander and roughly chop the leaves and tips. Finely chop the chives. Boil a small pan of water and on a medium heat cook for 5 minutes until soft and drain. To serve add around a handful of noodles to a large bowl and add a ladle full of boiling stock. Add a ¼ of the meat to the top of the stock. Sprinkle over some of the chives, coriander mint and a dusting of black pepper to finish. Complex but worth it!